Sometimes for whatever reason, a prospective User doesn't or can't receive emails sent from Brandkit, when you invite them to register as a user, or when Brandkit sends an email validation link (triggered by a self-service registration). Brandkit provides 2 options to help you get users on board. Double check you have the correct spelling and format of the users email address. Find the user concerned by entering all or part of their email address in the search box. Check the email is entered correctly and is valid. Once you've found the user, you should see a Resend link at the right side of the line. Click the Resend link to resend the User Invitation Email. Note the email will come from your Brandkit email from name, but the actual from address will most likely be noreply@brandkit.io. Click the View Details button on the right hand side of the User record to display the users information. Copy and Paste the link to your preferred communication application. 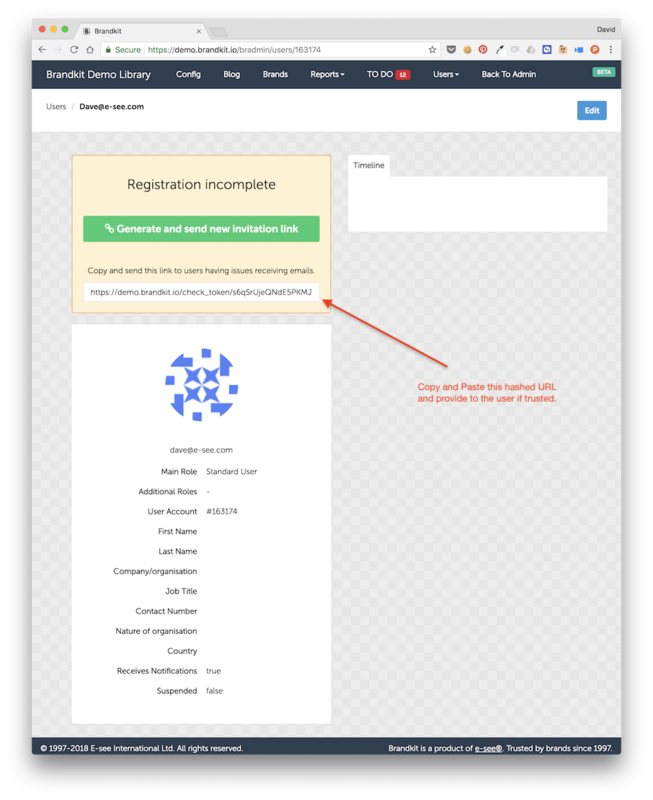 Once the user clicks or opens the URL in their browser they will be able to complete registration, as if they clicked the link in the standard email. Note: that this is option is in Beta at the moment and only available from the new Manage Users Beta screen. If both those option fail, we recommend you ask the user to contact support@brandkit.io directly, who will be happy to assist.